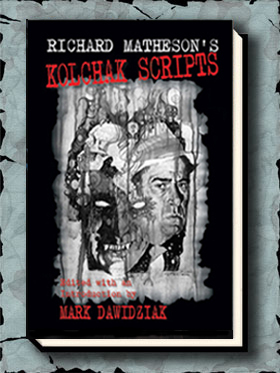 One of Gauntlet Press' most unique publications to date, a collaboration between father and son, Richard Matheson and Richard Christian Matheson. SKU: N/A. Categories: Books, Richard Christian Matheson, Richard Matheson. 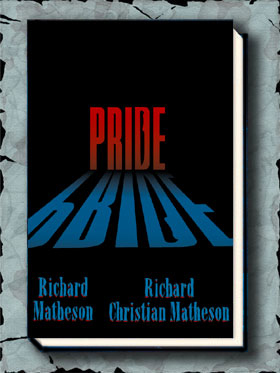 PRIDE is one of Gauntlet Press’ most unique publications to date, a collaboration between father and son, Richard Matheson and Richard Christian Matheson. PRIDE provides the reader with a look into the minds of these two authors as they created this joint effort. Ninety-nine percent of the time when you read a short story you see only the finished product. There is no first draft, no notes in the margin, nothing to let you know how the story progressed from an idea to its completed form. PRIDE provides that seldom seen glimpse. We approached Richard Matheson and Richard Christian Matheson to collaborate on a story of their own choosing. Father and son are both acclaimed for their writing; it made perfect sense, especially since they have worked together on a number of screenplays. The two Mathesons’ came up with an idea and then each went to work on his own short story. 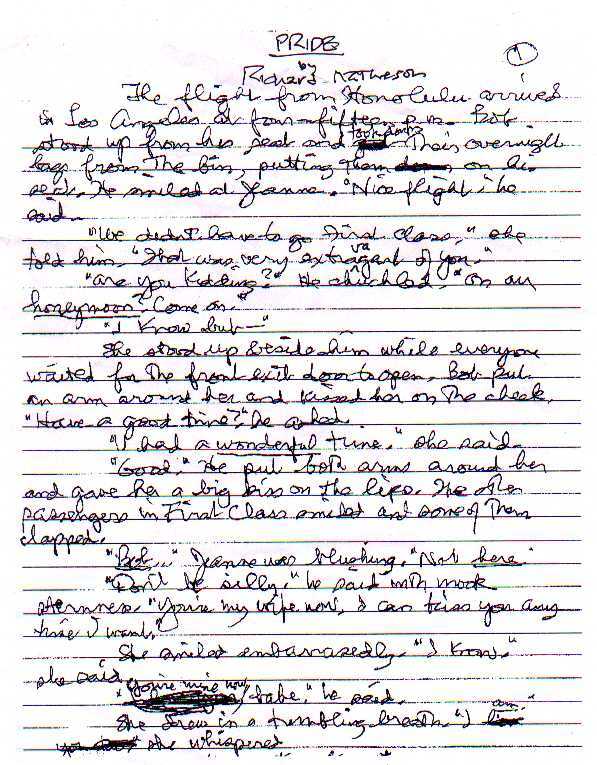 Richard Matheson writes all of his first drafts by hand. On the page shown here, you get to see Matheson’s first effort, which includes changes as he wrote the story. The entire handwritten story appears in the book. Interestingly, when the story was typed Matheson made only one change. Richard Christian attacks a story in a totally different manner. 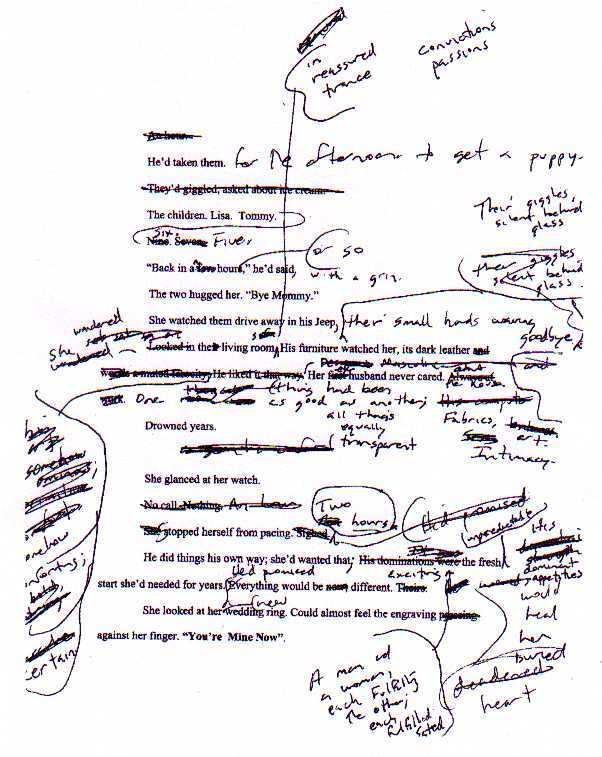 The page shown below is his first draft of PRIDE, which differs greatly from his final version. He types his first version, but makes corrections galore and jots notes to himself in the margins. In PRIDE we present Richard Christian’s full rough draft, his revised (final) adaptation of the story, as well as a handwritten version of the story (since he proofed it again in galley form we include his additional revisions as well). Here the project took a strange twist. Because of their widely divergent styles they couldn’t collaborate on a single story, which was the whole purpose of the undertaking. Gauntlet publisher Barry Hoffman suggested they write a teleplay instead. That is the final component of this project. When you read the teleplay you can see where Richard Sr. prevailed and where Richard Christian’s suggestion became reality. PRIDE is a truly fascinating look into how one legendary author and another highly acclaimed writer work alone and then together. Richard Christian also had a major role in the final look of the book. He suggested the 8 ½ x 11″ format. Rather than cover art, both Matheson’s wanted a simple, but elegant look (which you can see here). Both approved of the final design (we ALWAYS provide final approval of cover art to the authors). A final word. This is not a long book (just 48 pages, though they are 8 ½ x 11″), but what it lacks in quantity it more than makes up in quality. It is a one-of-a-kind, undertaking. Richard Matheson’s FIRST new short story since the 1970s. 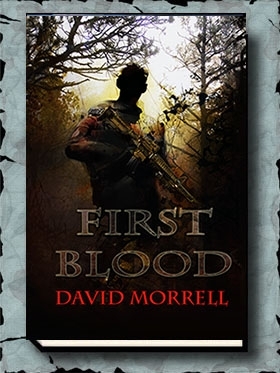 Rough drafts of the story by both authors you will seldom, if ever, see anywhere (not to mention that both the short story and teleplay are extraordinary tales). All in all, this is a unique father-son collaboration that will make a stunning addition to your collection.